Summer is in full swing and our family loves nothing more than refreshing easy meals and side dishes served alongside cold drinks. 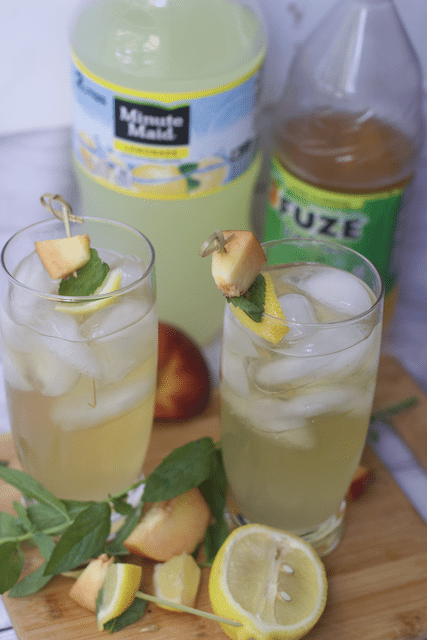 Today we are sharing an amazing combination of fruits and cheese that we are pairing with our favorite summer beverage, Arnold Palmers. These are the perfect selections for a summertime BBQ or along side a simple grilled piece of fish or chicken. We can’t wait to share these summer inspired dishes with you. How can your resist all these amazing summer fruit and herbs just waiting to be melded together in a simple but elegant salad. I used a melon baller instead of cutting the cantaloupe into squares, but do what is easiest for you. 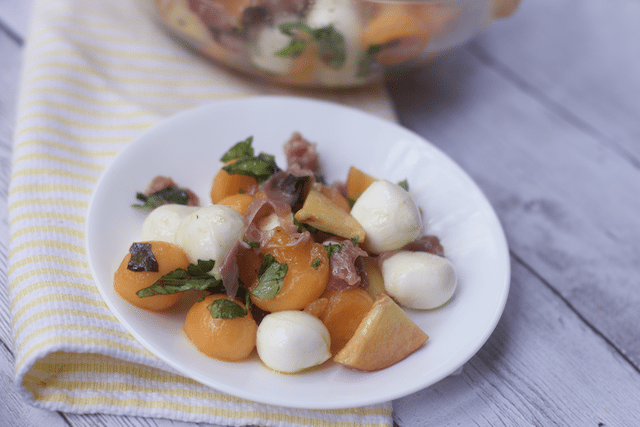 This salad consists of fresh cantaloupe, peaches, fresh mozzarella balls, mint, basil and prosciutto. Just mix all the fruits together, whisk a super simple dressing and lunch or a side salad is ready to eat. My kids were not huge fans of this, but I gobbled it up. 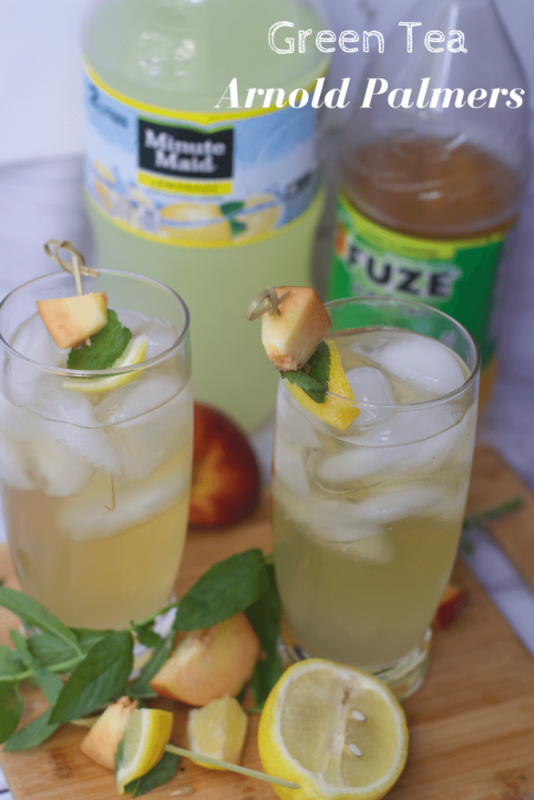 It’s light and refreshing and reminds me of a simple appetizer of melon wrapped in prosciutto. 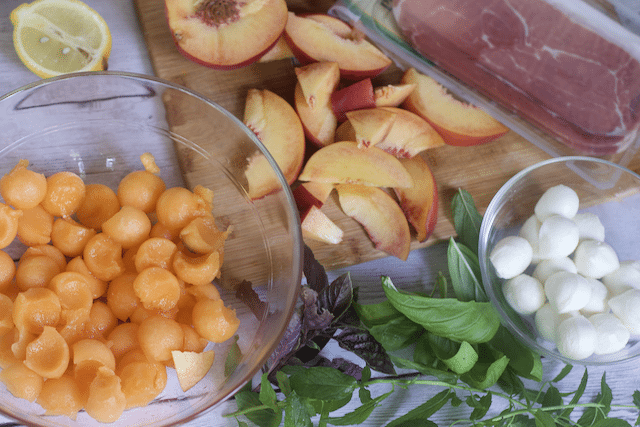 Don’t you just want to bite into this mixture of basil, mint, peaches, cantaloupe and fresh mozzarella? 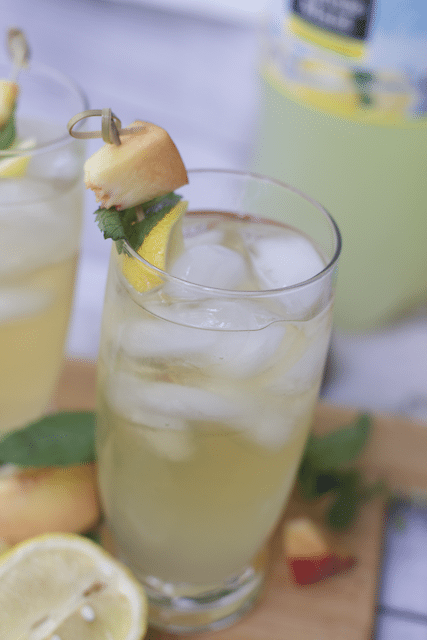 My kids’ favorite summer beverage is a mix of lemonade and iced tea in a tall glass filled with ice. 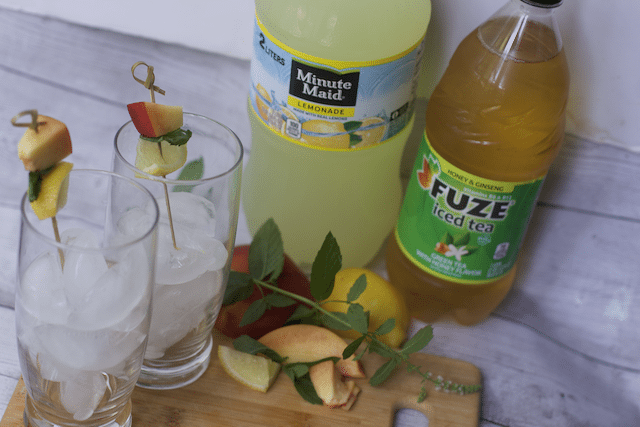 For summer entertaining, simply buy liters of FUZE® Tea (we found the green ginger variety), 2 liters of Minute Maid® Lemonade and fresh fruit from Food Lion. 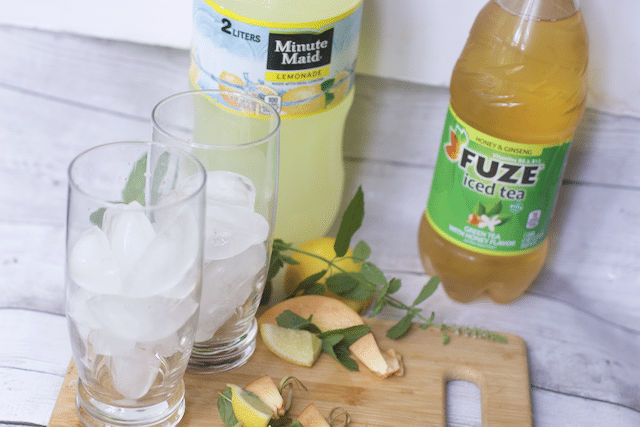 Fill your glasses with ice and fill them half with the lemonade and half with iced tea. Could not be easier than that! Make a few fun and summery picks of fruits to compliment this meal. 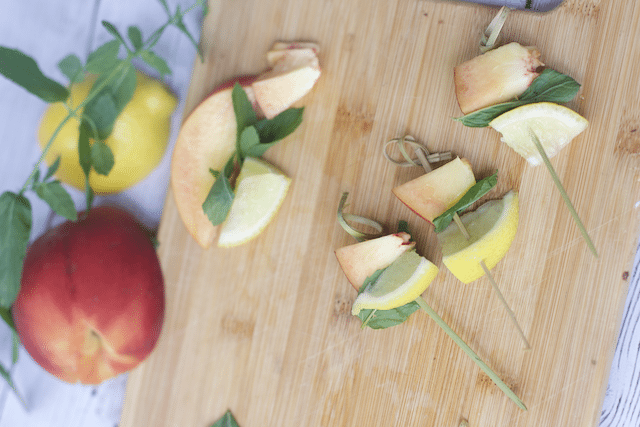 Skewer slices of peaches, lemon and mint leaves. 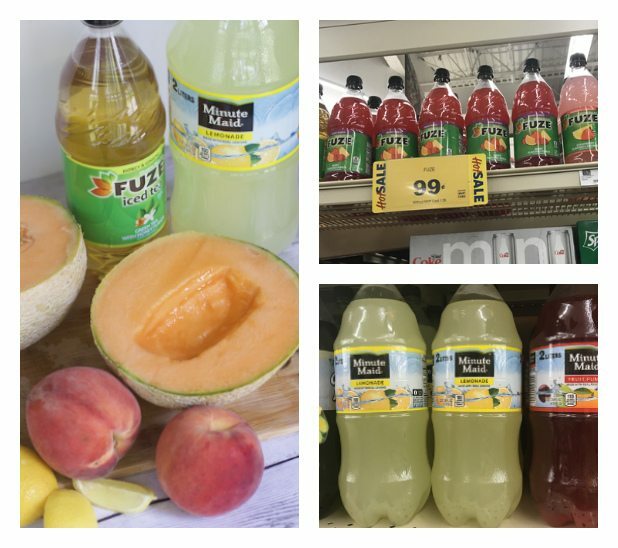 Look for all these ingredients next time your shop at Food Lion. Also check out the great deals on the Arnold Palmer ingredients. Use a melon baller to scoop balls from the cantaloupe half and add to a large bowl. Add the mozzarella balls and the torn prosciutto. Sprinkle with the basil and mint leaves. In a small bowl, whisk the olive oil, honey and white balsamic vinegar together and season with kosher salt and freshly ground black pepper. 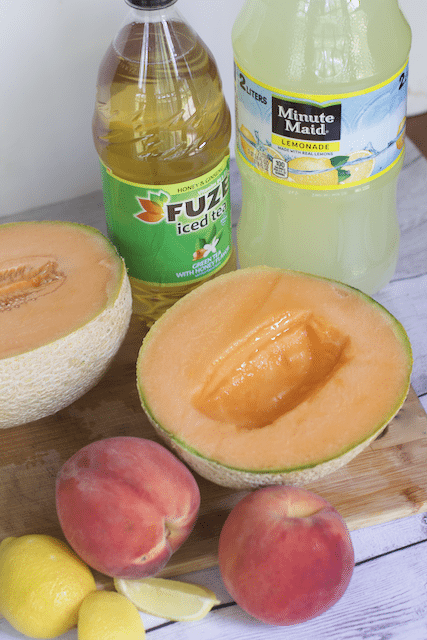 Drizzle over the cantaloupe and toss to coat. Season to taste. Eat immediately or serve cold. What is your favorite summer BBQ Salad and summer drink? Omg can we say yum?!?! Any excuse to eat mozzarella gets two thumbs up from me!!! Must try! Wow. That is an interesting salad. I have never tried mixing fruit (especially the pulpy ones) with mozzarella. I will make this salad and I am sure I will enjoy this. I love melons, my husband loves peaches and both of us enjoy mozzarella. Win. This looks super tasty! Love summer and the bright, light flavors it brings! I used to hate fruit in my salads, but am coming around to the idea. Had one the other day with oranges and loved it! 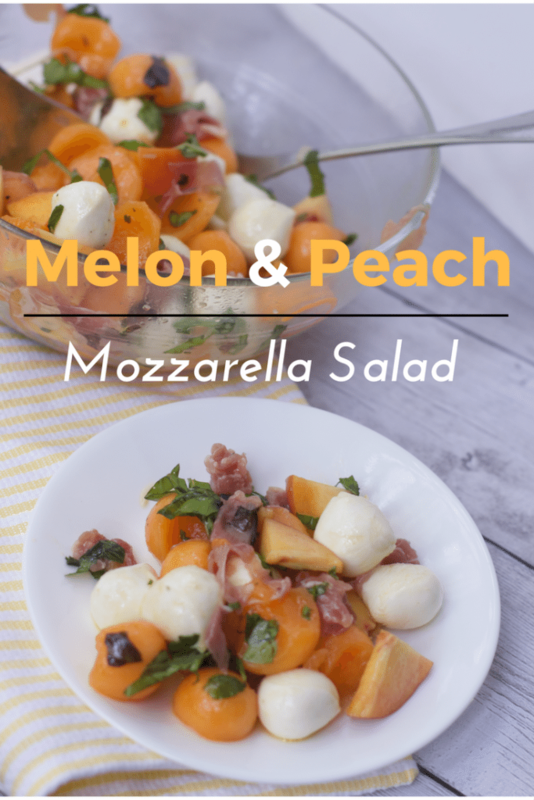 Your Refreshing Melon Peach Mozzarella Salad Recipe sounds absolutely amazing for hot summer weather. I just wish that I could eat melon! This salad looks amazing. I love peaches and mozzarella cheese and the two together is even better. Thanks for the recipe. This is a perfect summer post. A refreshing crisp salad and a delicious cold drink. Thanks for sharing. I could really go for a fruity salad like this! That mozzarella must be really good with those summery flavors! What an interesting combination, I never thought to try this combo. I have some fresh mozzarella though so worth a try! 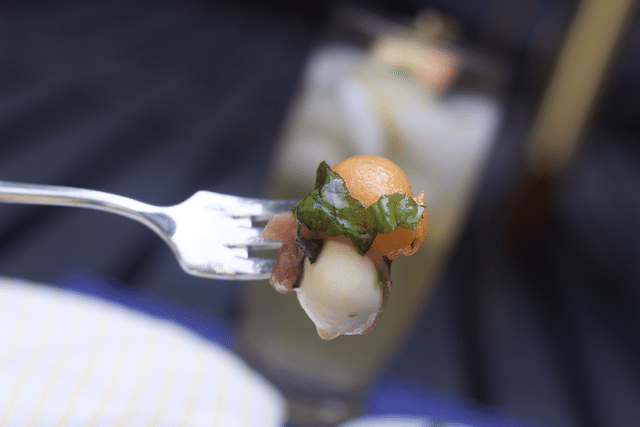 I thank you for this peach melon mozzarella salad idea! Ooooh I like this combination. I have never had mozzarella cheese with any kinds of fruit before, but would love to try this.